I’ve got a houseful this week—two sons, a daughter-in-law and grandkids (Leo, 12; Lucas, 11, and Nico, 8). They are a busy crew, off to the beach, connecting with old friends, shopping, visiting former haunts. I am so out of practice! I scramble to keep up, buying enough bread, melons, eggs, jars of mayonnaise (of preferred brands), wine, beer. Meal planning is a challenge, working around kids’ likes and dislikes. And, I haven’t yet gotten everyone to the table at the same time. 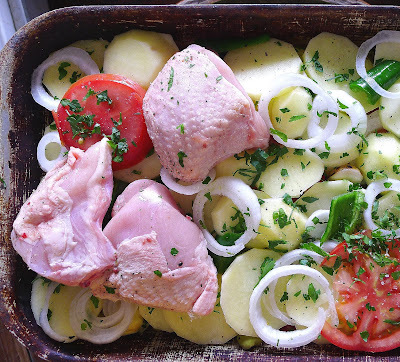 Chicken bakes with potatoes and vegetables in an oversize pan--plenty for a crowd. 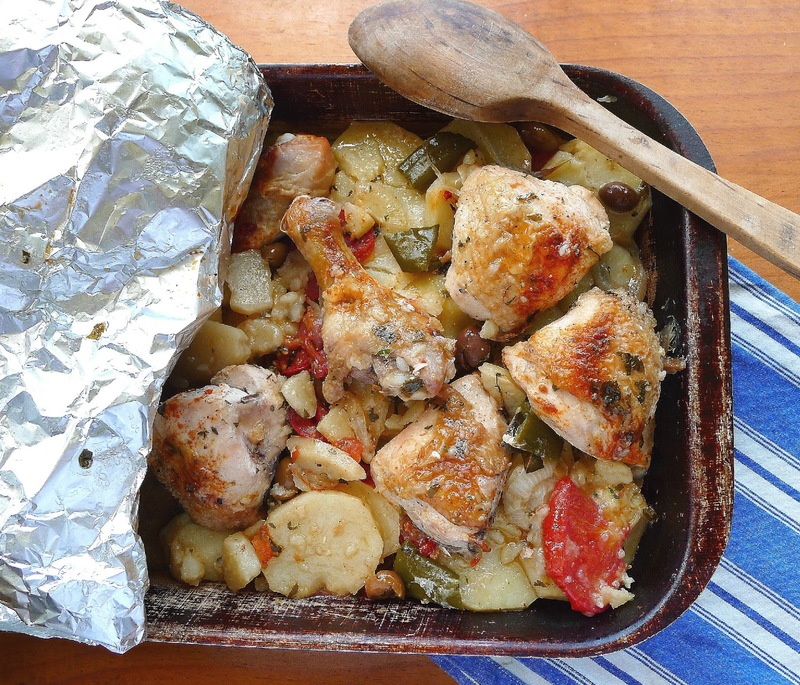 Here’s my favorite, easy meal to serve a crowd—pollo en lata, chicken baked in a huge pan with layers of potatoes, tomatoes, onions and peppers. A lata is an oven pan. When a gang of relatives or out-of-town friends are getting together at your house, you go the local bread bakery and borrow a lata--in this case a huge one--fill it with chicken pieces, potatoes and seasoning, and take it back to the bakery to bake a few hours in the bread oven. I made this for the family on Day 2, planning for a 9 pm dinner, our first with the three cousins together. But a mishap at the beach sent them to the emergency room. (Nico got a blow to the ear, but is fine.) I set the pan on the table and fell asleep in front of the TV. At 11 pm they arrived, famished. By then, the potatoes had soaked up all the delicious juices in the pan and were even better than when hot out of the oven. Plated, the baked chicken and vegetables are fine for a dinner party. I’ve also made this baked chicken for a holiday dinner party. On that occasion, rather than put the huge pan on the table, I plated the servings in the kitchen. 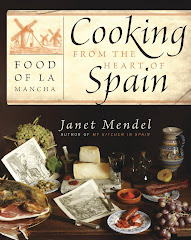 Use a pan (lata, rustidera or besuguera) about 10 X 15 inches and at least 2 ½ inches deep. Or, divide the ingredients between several smaller pans. A roasting pan would work well if you haven’t got a flat pan. I’ve elaborated on the traditional version of this dish, adding chopped chard on one occasion and pitted olives on another. Sliced vegetables to be layered with potatoes. Sprinkle chicken pieces with salt and pepper and allow to set 30 minutes at room temperature. Put 2 tablespoons of the oil into the bottom of the pan. 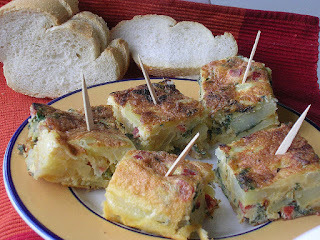 Arrange layers of potatoes, tomato, green pepper, onion and chopped chard, if using. Sprinkle each layer with a few cloves of roasted garlic, salt, pepper and parsley. Continue to layer all of the potatoes and other vegetables. 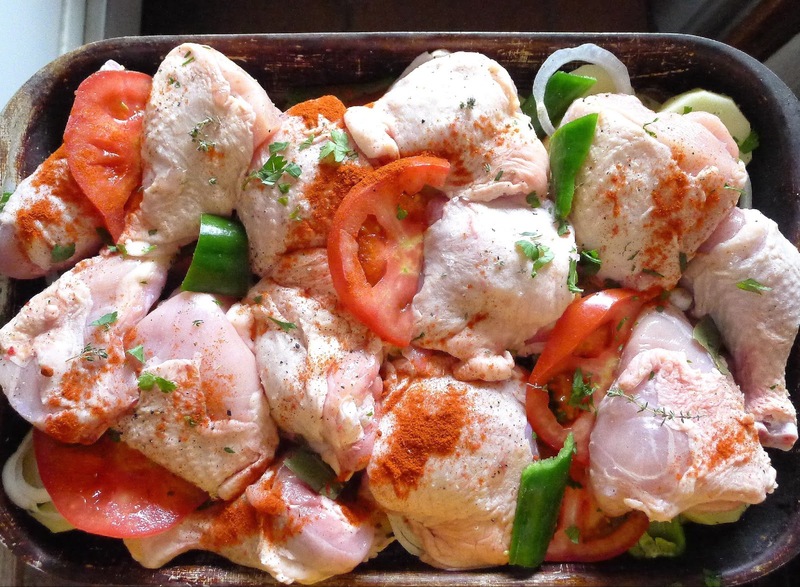 Place seasoned chicken on top of layers of potatoes, onions, tomatoes and peppers. Place the chicken pieces on top. 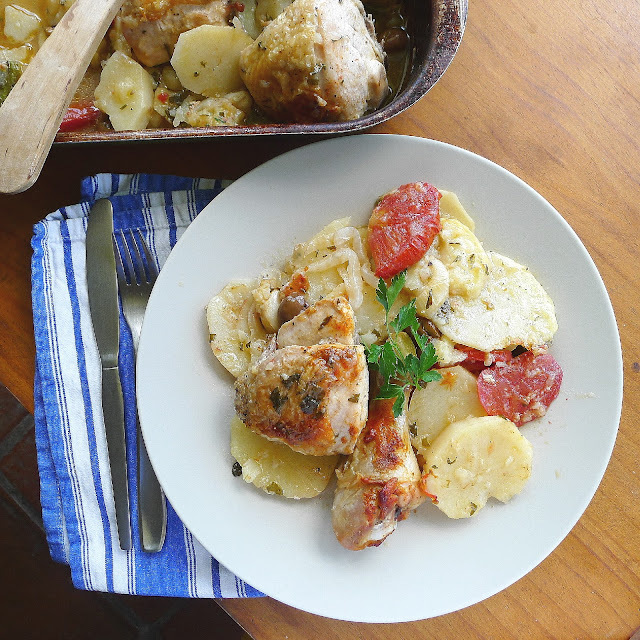 Break the bay leaves into pieces and tuck into the potatoes. Sprinkle with pimentón and thyme. Pour over remaining oil and the wine. Ready for the oven. 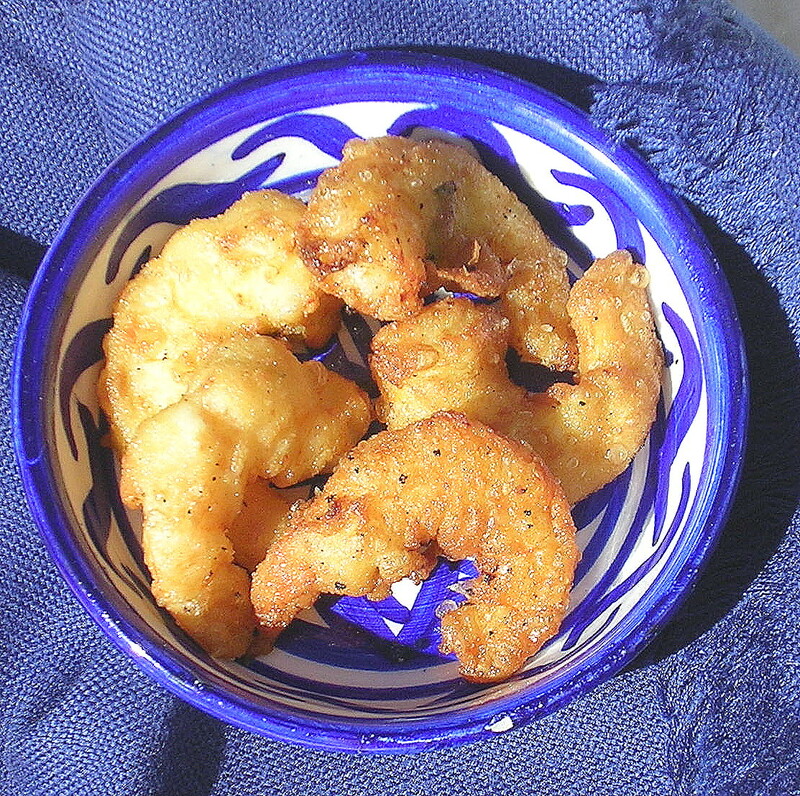 A dusting of pimentón adds flavor and color. Cover the pan with foil and bake for 15 minutes. Reduce oven heat to 325º and bake another 60 minutes. Remove foil cover and bake 15 minutes. To roast a whole head of garlic: Spear the head of garlic on a fork or grasp it with tongs and hold over a gas flame (or put under the broiler), turning, until it is charred. Peel the garlic cloves, rinse in running water and add them to the pan. 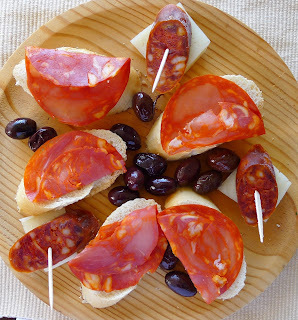 Did you celebrate World Tapas Day? 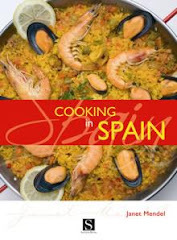 That was June 16 (third Thursday of June), declared by Turespaña to promote Spanish gastronomy. 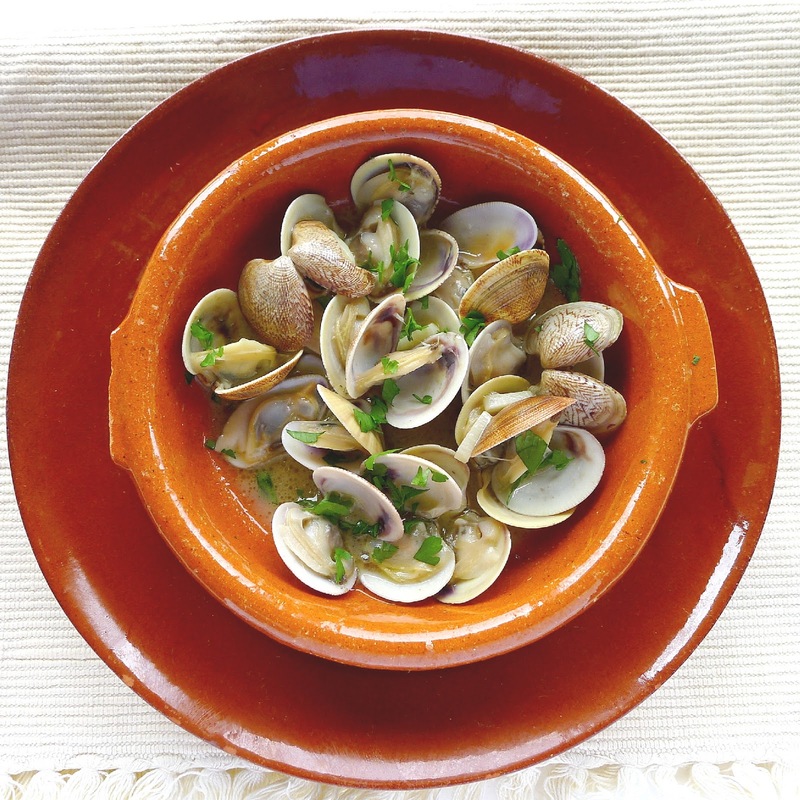 Restaurants and taverns all over the globe have joined in the celebrations of Spanish tapas. Since there’s no expiration date on tapas, we can celebrate today and next week just as well. 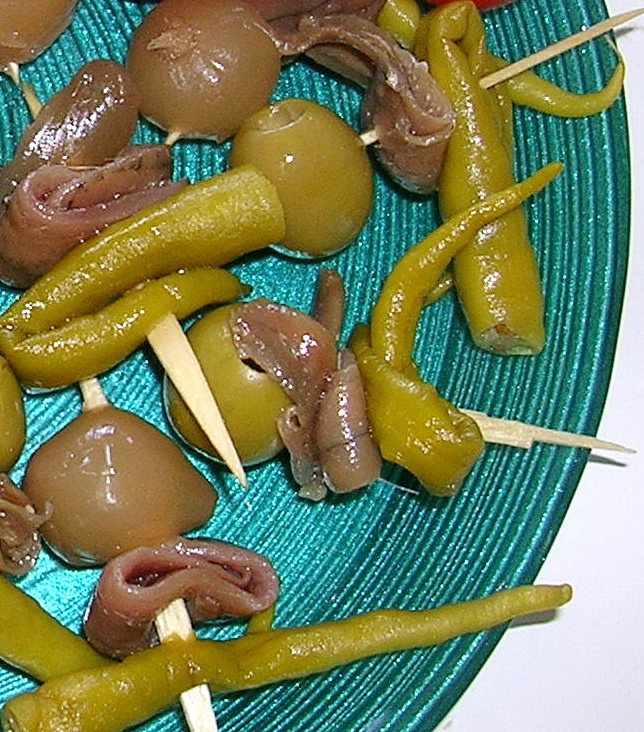 So, what are tapas, anyway? 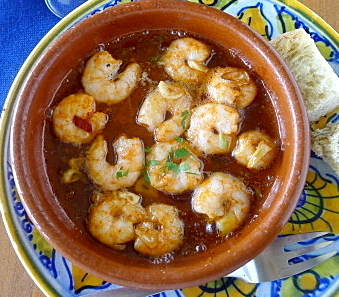 In Britain and America tapas are usually interpreted as small-plate dining, a series of dishes to be shared at the table. But, on home ground, in Spain, tapas are not really an alternative way of dining. 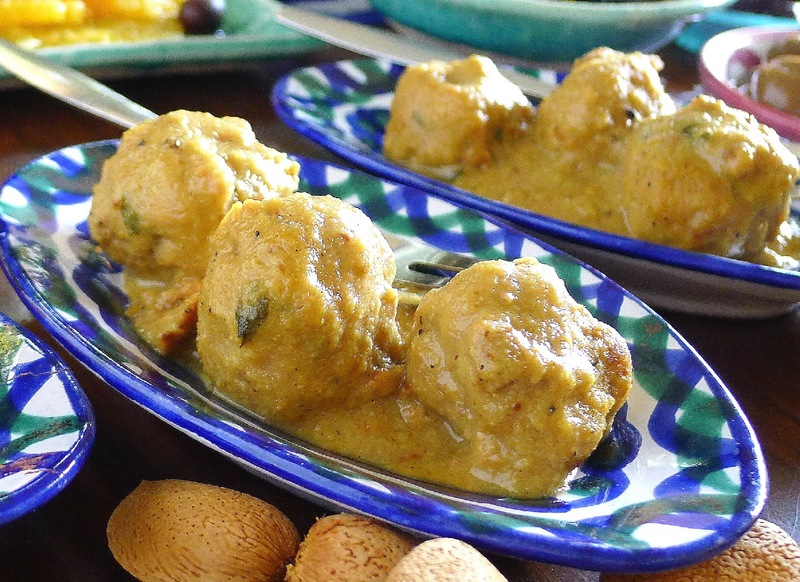 For one thing, you might never sit at a table to have tapas. You stand at the bar or at little side tables, a window ledge, an upended barrel, any place to set a wine glass and small plate. And, you may or may not consume a quantity of tapas that adds up to a whole meal. The tapeo is a movable feast--you stop at one bar to taste its specialty, then stroll up the street to another, around the corner for a third round. When you bump into another group of friends, you move on to a different locale. 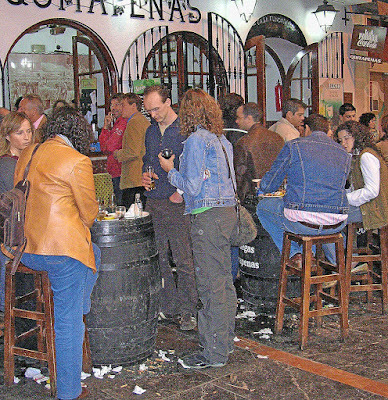 Part of the attraction of the tapeo is the paseo, stroll, and the movida, the action, the buzz. The movement is part of the entertainment. Going out for tapas is a social event, so you need a little gang, a cuadrilla, of three, four or five people, for a proper tapas crawl. Each pays for a round of drinks and tapas. You may order a second round or move on to another bar. Many bars serve a complimentary tapa—a few olives, a golden croquette, a meatball—with every glass of wine or beer. But then you order from a list of tapas and pay for them accordingly. 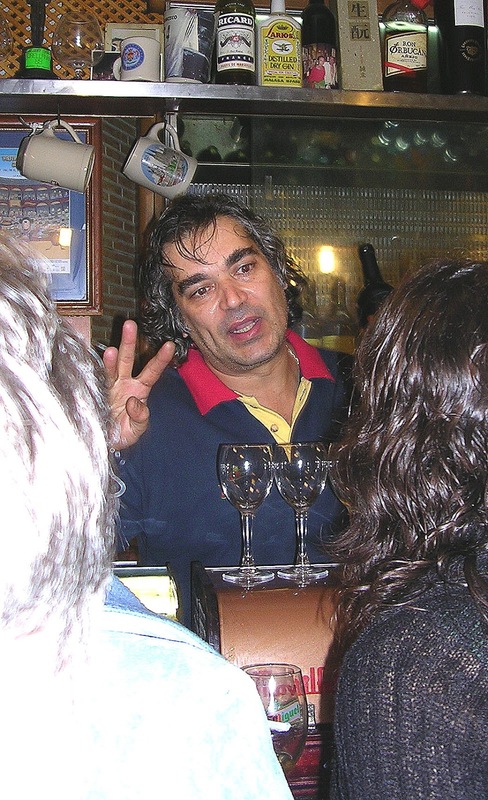 In some bars, the list is chalked on a board; in others the waiter spiels off in rapid-fire the pregón, or selection. If you don’t catch the recitation, press your way up to the bar and have a look at the platters of food on display. Bar guy lists the tapas. 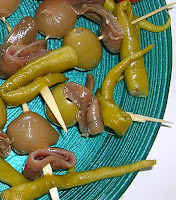 A tapa is a small, individual portion, really just a bite or two, not meant to be shared. 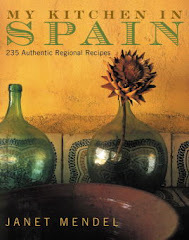 But the list of specialties may be offered in three sizes (and three prices)—tapa, media ración (half plate) and ración (whole plate). In Spain, it’s part of the tapas way of life to stop in a tapas bar on your way home for lunch or dinner and have a vinito, a little glass of wine, or cañita, a short beer, with just one small tapa taste. However, if you go out with some friends with the plan of stopping in several bars, then you’re de tapeo, on a tapas crawl. Over the course of an evening, tapas and accompanying drinks add up to supper. 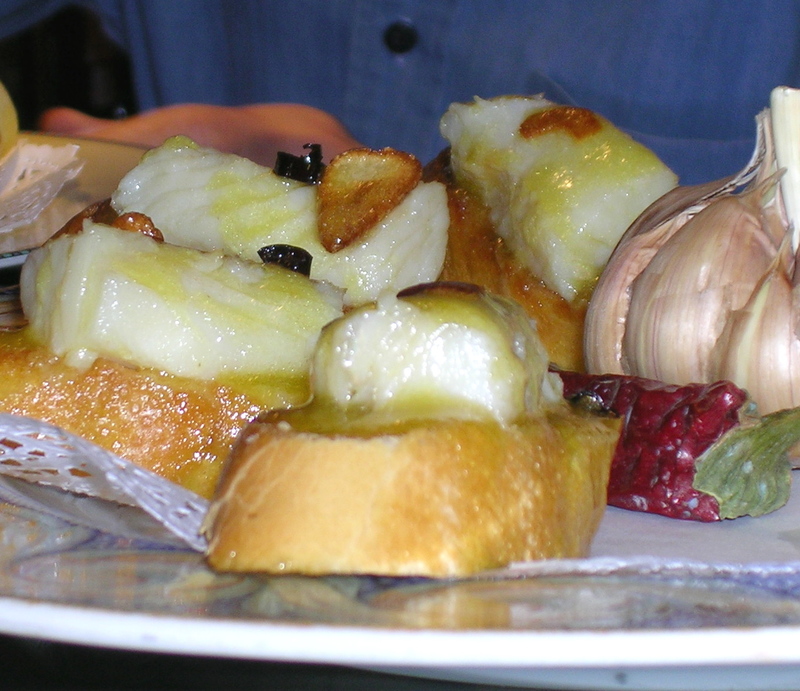 In the Basque Country, the tapeo is ir de pintxos, to go for pintxos, which is the Basque word for small-bite foods stuck on picks. 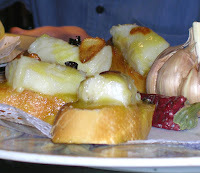 Ir de pintxos in the Basque Country. 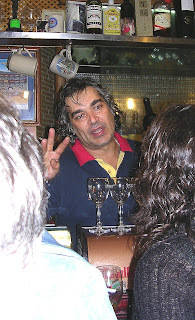 Bar-hopping is el copeo, chiquiteo, chateo or poteo, terms derived from different words for a wine glass. In Galicia, it’s tomar una taza, to have a “cuppa”, because wine used to be served in small, white porcelain cups. Where can you expect to sample tapas? Many tapa bars are like your local friendly neighborhood pub, where you might stop off for a copa, enjoy a few bites of local sausage, listen to the evening news or stay on for the football game. Bar means a bar or pub, while a barra is the actual bar-top, of wood, zinc, stainless steel or tile, where the tapas are displayed. This Madrid bar features Spanish ham. 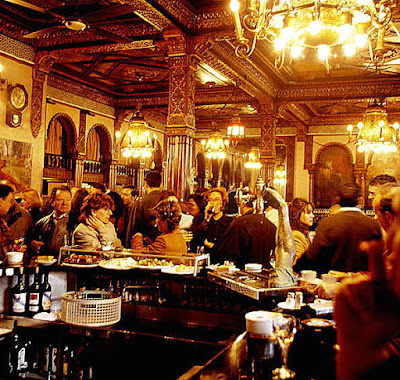 In addition to bars, you can go for tapas to a taberna or tasca (both words for tavern), a bodega (barrel room or wine cellar), a cervecería (beer bar), a sidrería or chigre (cider house), a champañería (where cava or Champagne is served), a marisquería (where shellfish is served), a freiduría (fry shop), a mesón or restaurant that also has a bar. A wine bar, vinoteca, probably serves tapas, usually paired with wine selections, but a bar de copas, cocktail bar, does not. 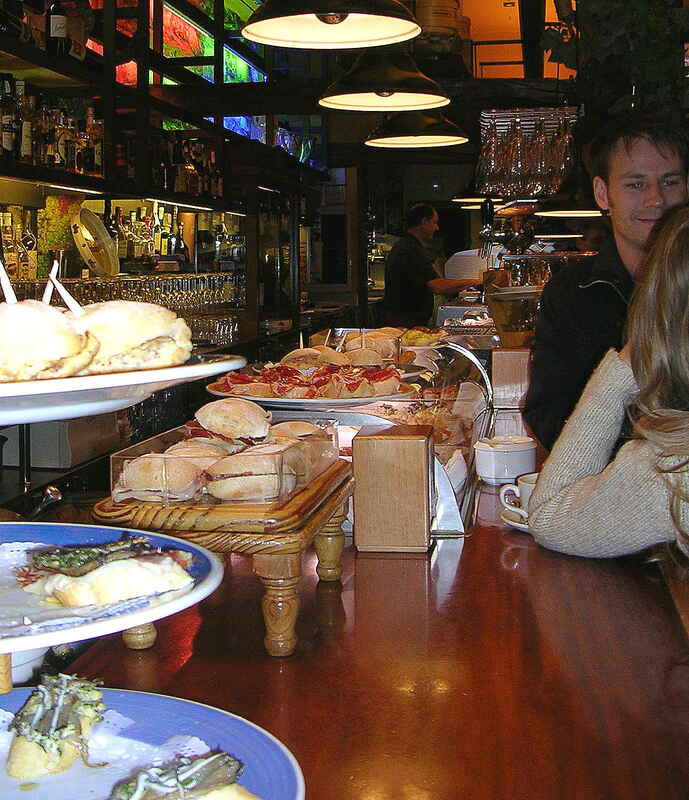 Many cafés morph into tapa bars once the breakfast trade is finished. 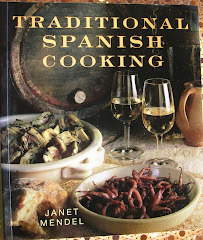 So, what’s for tapas? The variety is stunning. 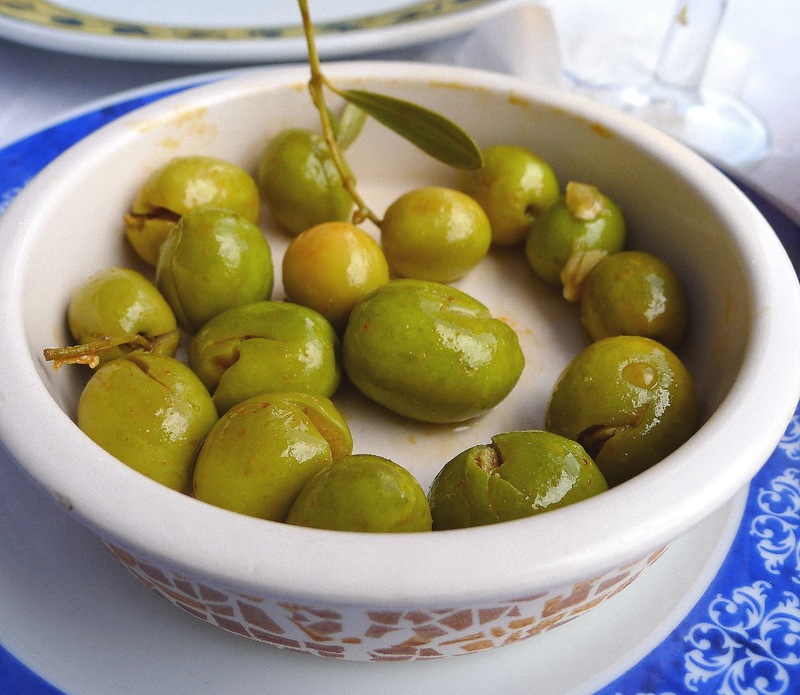 You can sample lots of flavors without eating large quantities of food, so they make a great introduction to Spanish food. You can choose foods in any order you like, eat meat and fish in any combination. Tortilla--eggs and potato omelette--is Spain's favorite tapa. Order a tabla, board, of sliced sausages and ham. A classic--gambas al ajillo--sizzling shrimp. Patatas bravas--fried potatoes with spicy sauce--a Madrid favorite. Bacalao pil pil, cod in a garlic sauce. 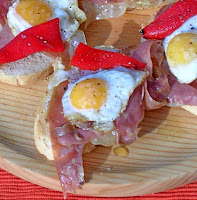 Cheeky quail eggs and ham on toasts. Tapa bars serve from 10 to 50 different dishes, although some specialize in variations on a single theme. 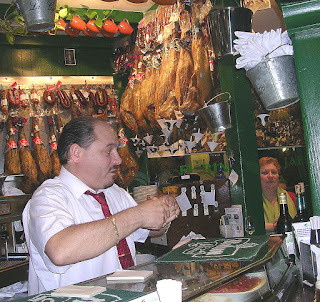 So, a particular bar may serve only ham and sausages; another, only bacalao (salt cod) dishes; others, exclusively shellfish, or snails. 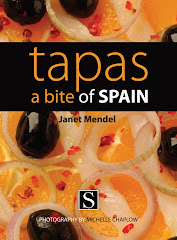 Tapas in Spain range from very traditional home cooking to the innovative and trendy. The small-bites concept provides chefs a showcase for their latest culinary creations and allows diners to sample a wide range of dishes—a sort of tasting menu—without spending a lot of money. 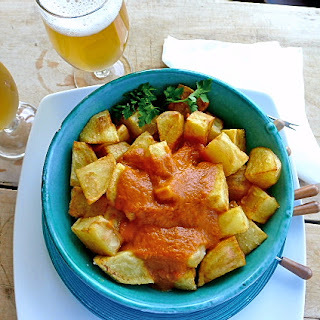 Tapas are not necessarily finger-food, as some stews and sauced foods may require a spoon or fork plus bread for mopping up delicious sauces. But you should be able to eat them standing up, with just one hand. 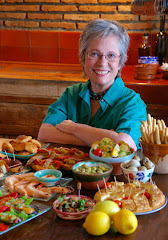 The tapas experience is not just about the food and drink. It’s about conviviality. When the weather is fine, the tapa scene spills outdoors and becomes part of street life. Some bars place high, stand-up tables on the pavement. You get your wine and plates of food at the bar, then regroup outside. What a good place to see and be seen, to keep an eye on who’s coming and going! Tapas have their pace, which is leisurely. Spaniards can put away quite a lot of food while just standing at the bar, sipping wine and having an animated conversation with friends. In Spain, tapas are a way of life. 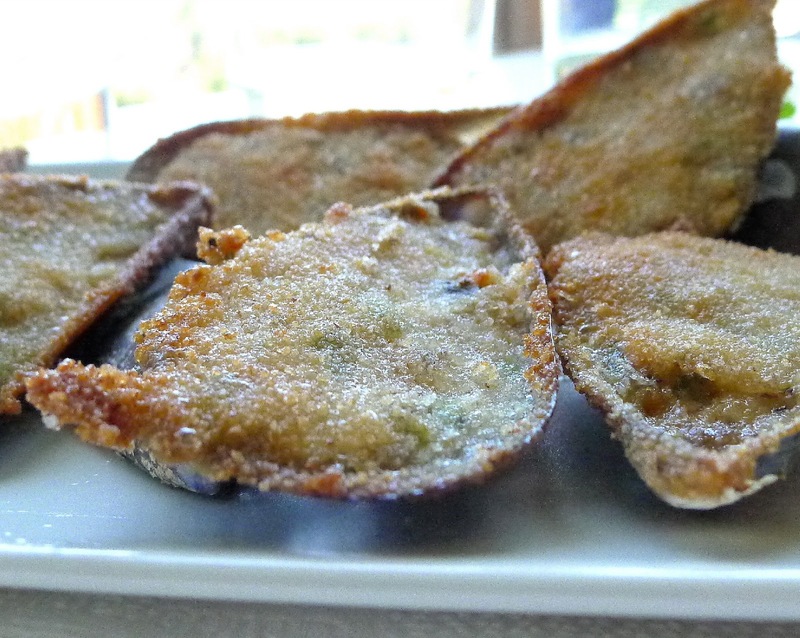 Fried crisp, the stuffed mussels are creamy on the inside. Put the cleaned mussels in a deep pan with the water. 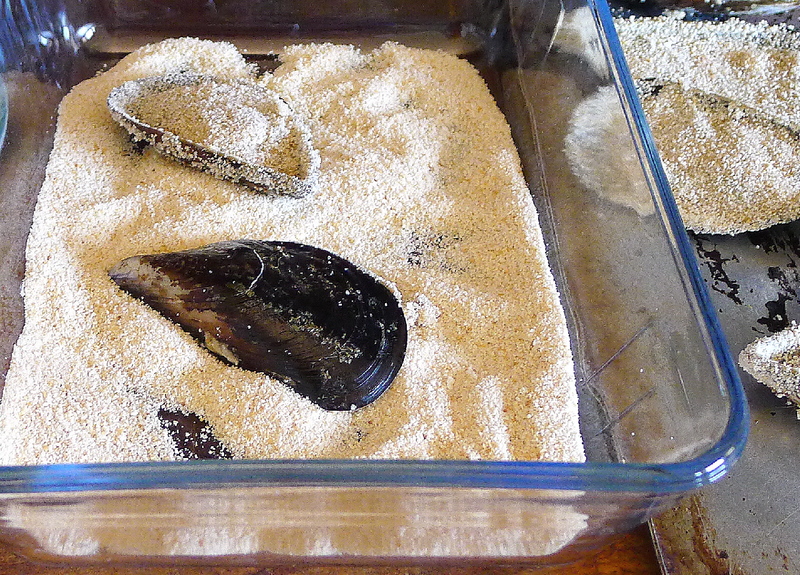 Cover the pan and shake over high heat until mussels open. Remove from heat and discard any mussels that do not open. When mussels are cool enough to handle, remove the mussel meat from the shells and chop it. Save 18 of the shells. Strain the mussel liquid and reserve it. 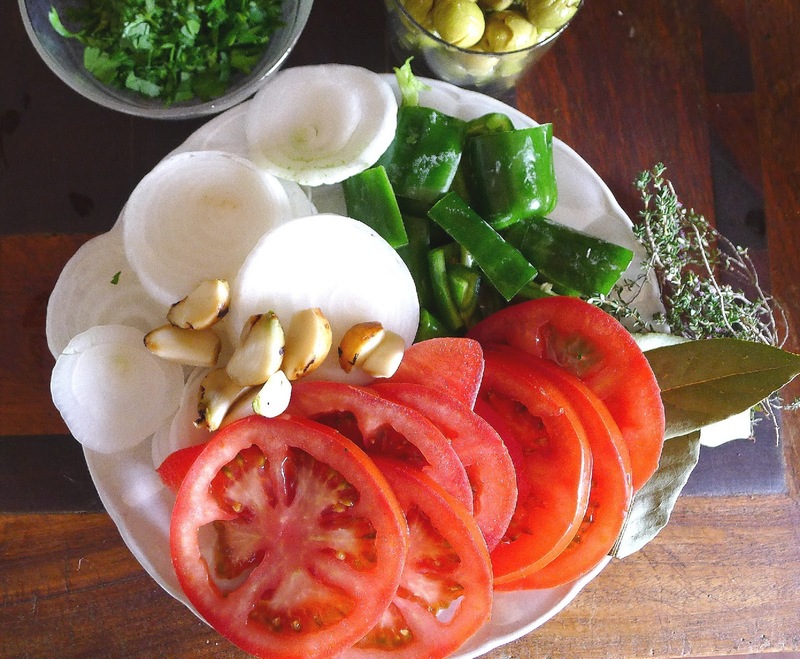 Heat the oil in a saucepan and sauté the onion until it is softened, without letting it brown. 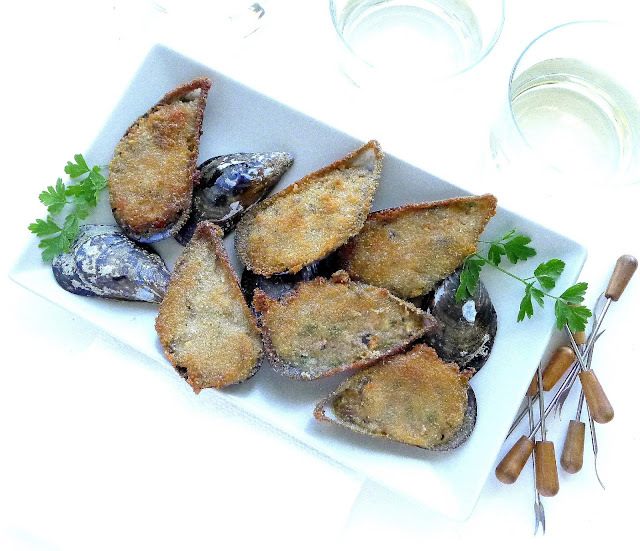 Stir in the flour, cook for a minute, stirring, then whisk in the wine and 1/2 cup of the mussel liquid. Cook, stirring, until the mixture is thickened and smooth. Stir in the chopped mussels, the pimentón and the parsley. 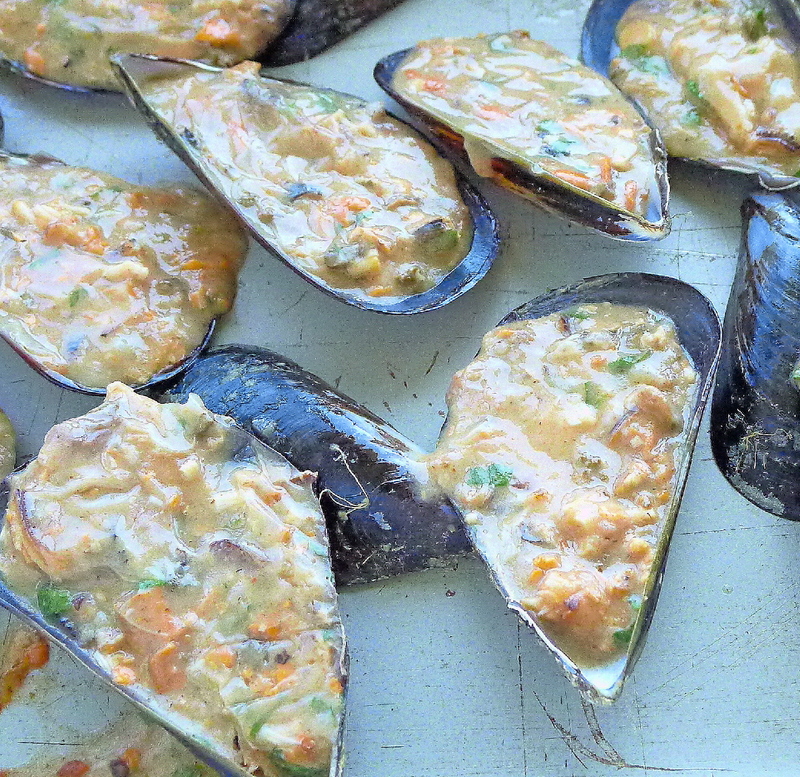 Fill shells with mussels in sauce. Put a spoonful of this sauce onto each mussel shell and smooth it level with the top of the shell. Place the filled shells on a tray in a single layer and refrigerate until the sauce is firmly set, at least one hour. Place the beaten egg and the bread crumbs in two shallow bowls. Dip the mussels, open face down, first into egg, then bread crumbs. Arrange them on a tray in a single layer. (The mussels can be prepared up to this point, then frozen. Freeze them in one layer, then pack them carefully in a freezer bag or plastic container. Let them thaw one hour before continuing with the preparation.) Otherwise, fry them immediately before serving. 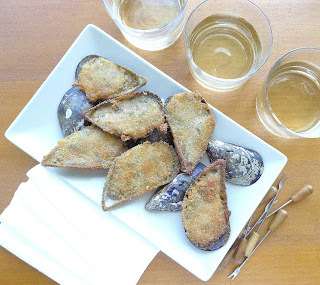 To fry the mussels, heat enough oil to cover the bottom of a frying pan. 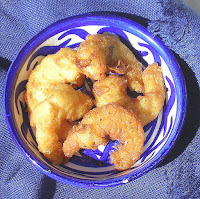 Fry them in two or three batches, breaded side down, until golden brown. Drain briefly on paper towel and serve hot. 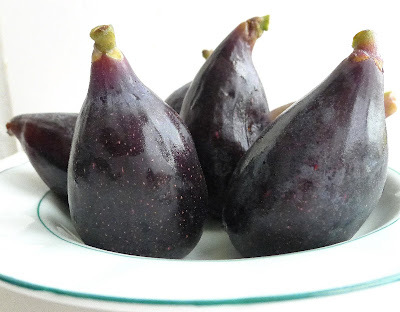 If it’s coming up to midsummer, the festival of San Juan (June 24), it’s the season for brevas, early figs. 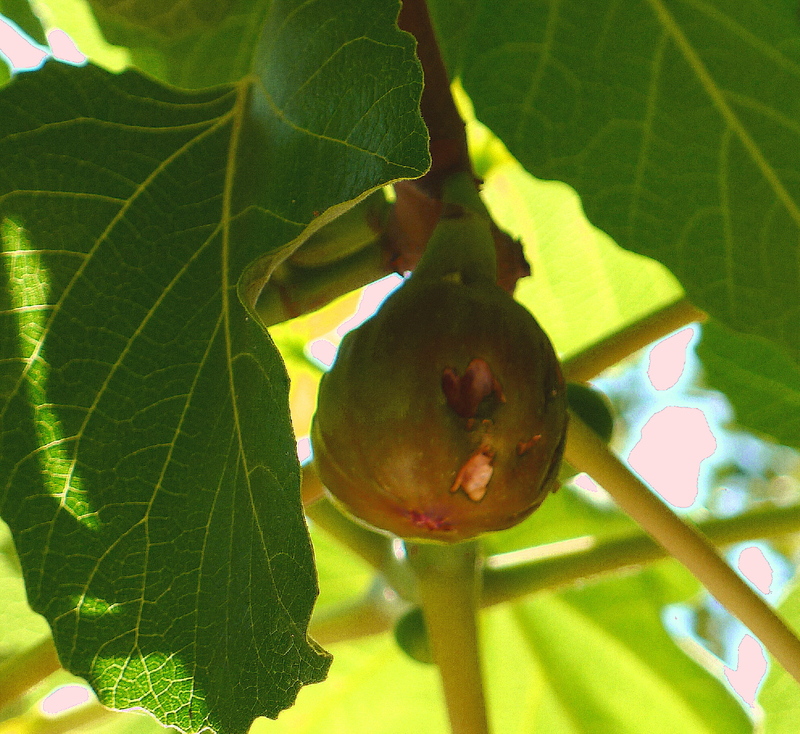 Brevas are the first of two crops that a fig tree produces (sometimes). They arrive in early summer. A more abundant picking follows in late summer—August into September. Brevas are early figs, ripe by midsummer's eve. Birds are pecking figs on my tree. Brevas, the early figs, are so esteemed (and expensive) that it seems a shame to do anything other than eat them, raw, in all their glory. Brevas should be soft and, when fully ripe, may have slightly wrinkled or split skin. They don’t keep well, so it’s best to enjoy them when they first arrive in the markets (or, on the tree). 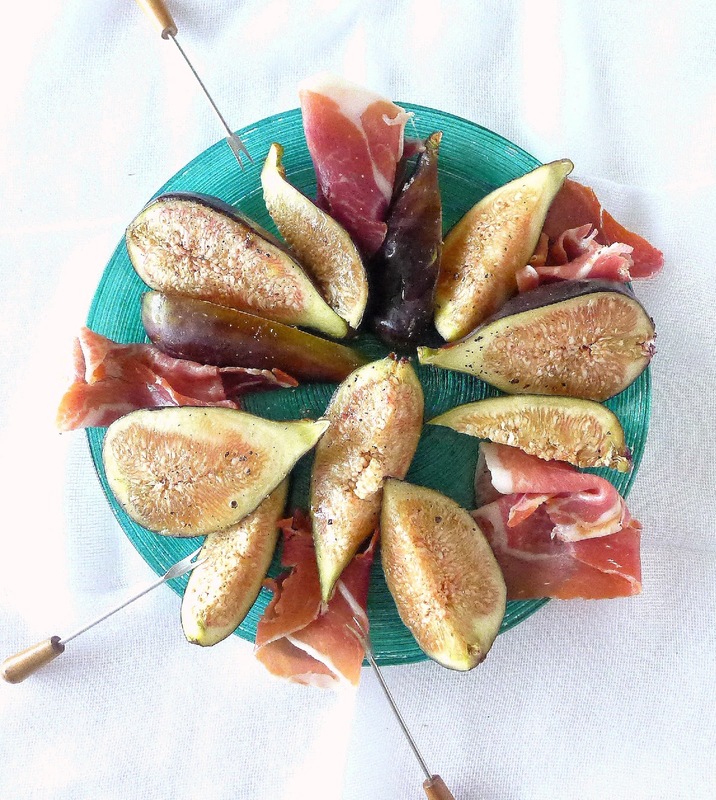 Slice the figs (you don’t need to peel them), macerate in a little sweet Málaga wine or PX Sherry. Serve with whipped cream or ice cream. 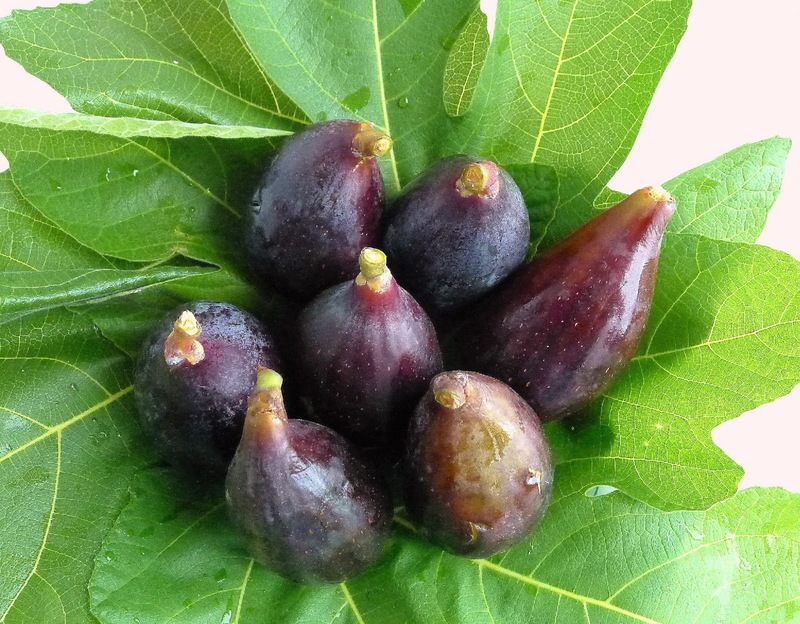 Quarter the figs, drizzle with extra virgin olive oil and freshly ground black pepper. 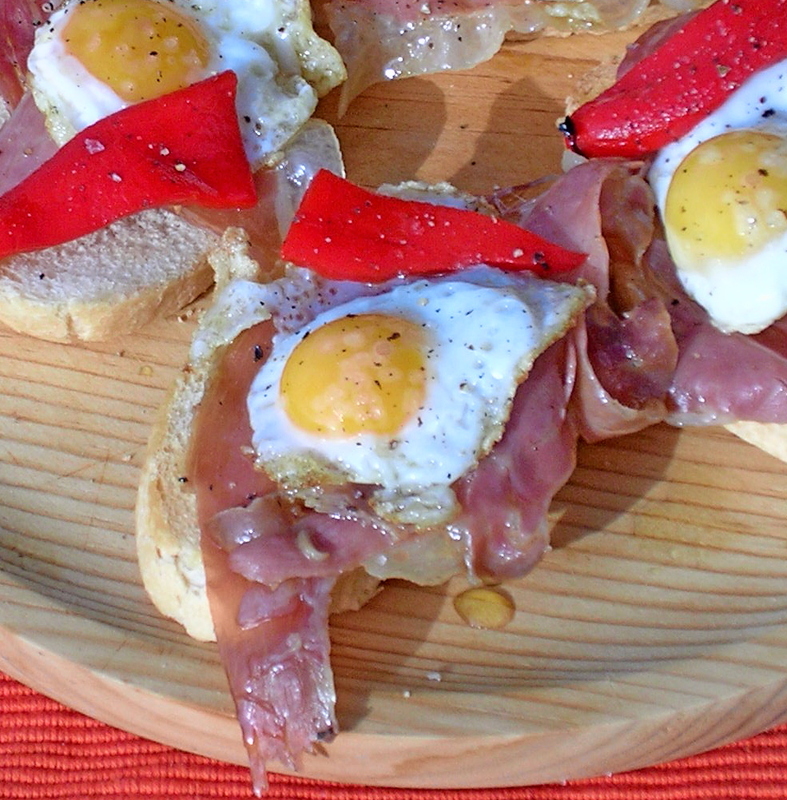 Serve with sliced ibérico or serrano ham. The sweet fruit and salty ham make a brilliant pairing. Serve ripe figs with sliced Spanish ham. Arrange sliced figs on top of a custard tart. Glaze them with a little melted fig jam or orange marmalade. Spread toasts with softened cream cheese. Top with sliced figs. Sprinkle them with drained green peppercorns. Stuff whole figs with softened blue cheese. Garnish white gazpacho (ajo blanco) with chopped brevas in early summer (muscatel grapes in late summer). 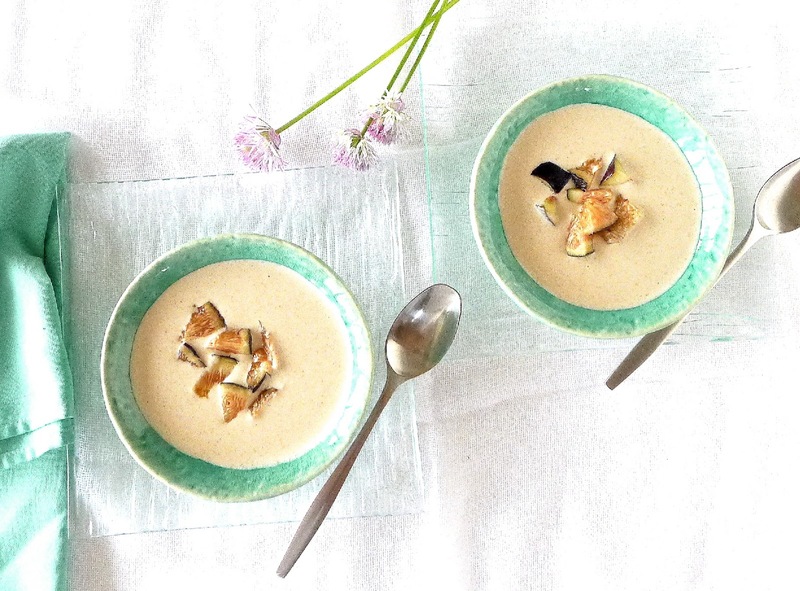 Garnish white gazpacho with figs. 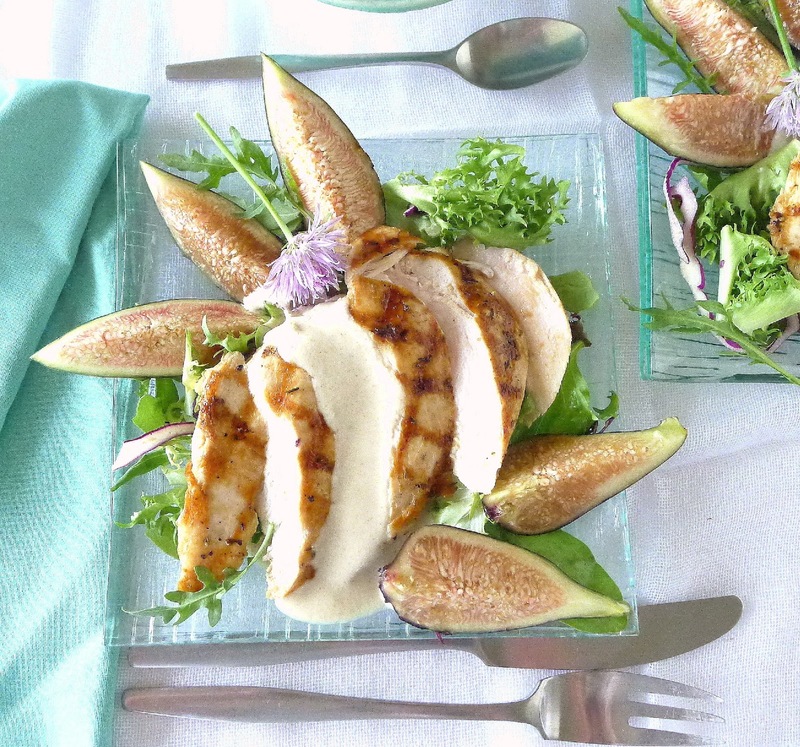 Add fresh figs to salad. 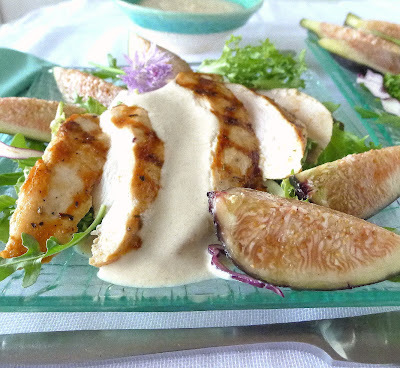 Here’s a recipe for a chicken salad with figs and a dressing of ajo blanco. 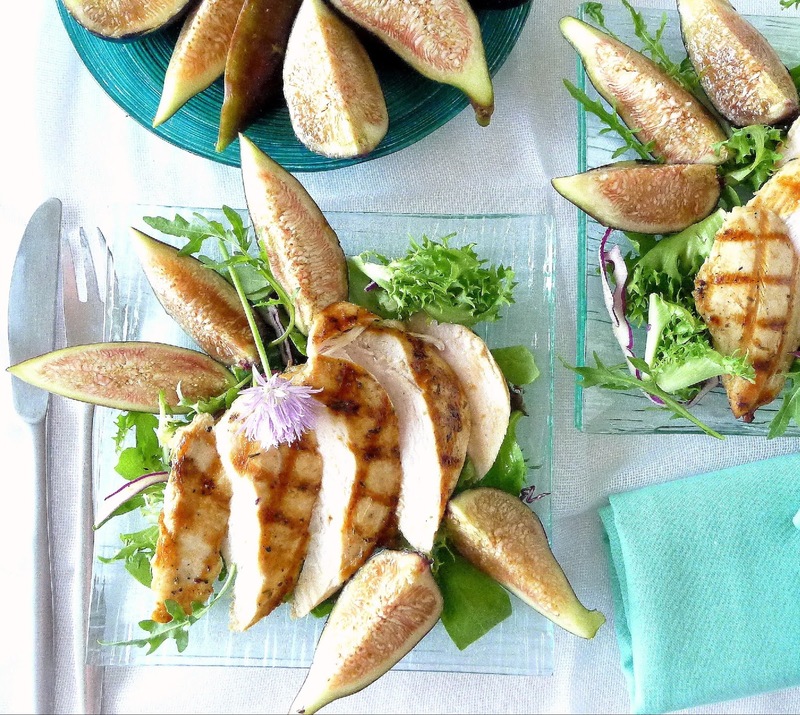 Summer salad--grilled chicken and sliced figs. Place the chicken breasts in a shallow bowl. Sprinkle them with 1 teaspoon salt, pepper, thyme, vinegar and olive oil. 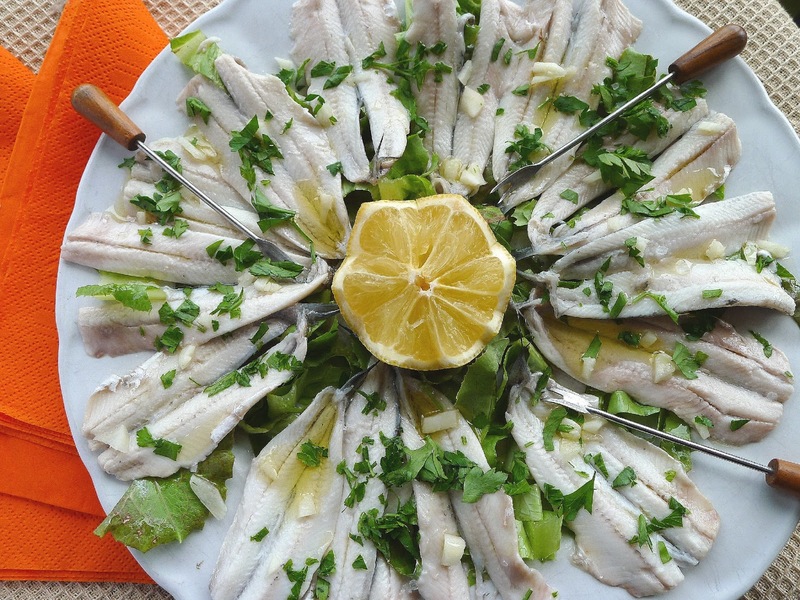 Allow to marinate 30 minutes at room temperature or up to 8 hours, covered and refrigerated. 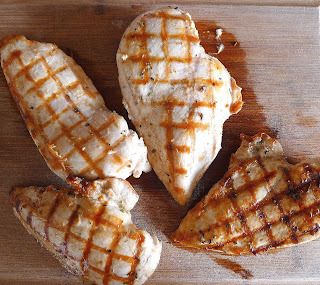 Use a ridged grill pan to cook chicken breasts. Heat a ridged grill pan until very hot. Brush it with oil. Lift the chicken breasts out of the marinade (discard marinade) and grill them 3 minutes. Turn 90º and grill 3 minutes longer. Turn the chicken breasts and again grill 3 minutes and turn. Grill until they are just cooked through, about 3 minutes longer. Remove the chicken to a cutting board. Arrange salad greens on 4 plates. Slice the chicken breasts and place on the greens. Place the figs around the chicken. 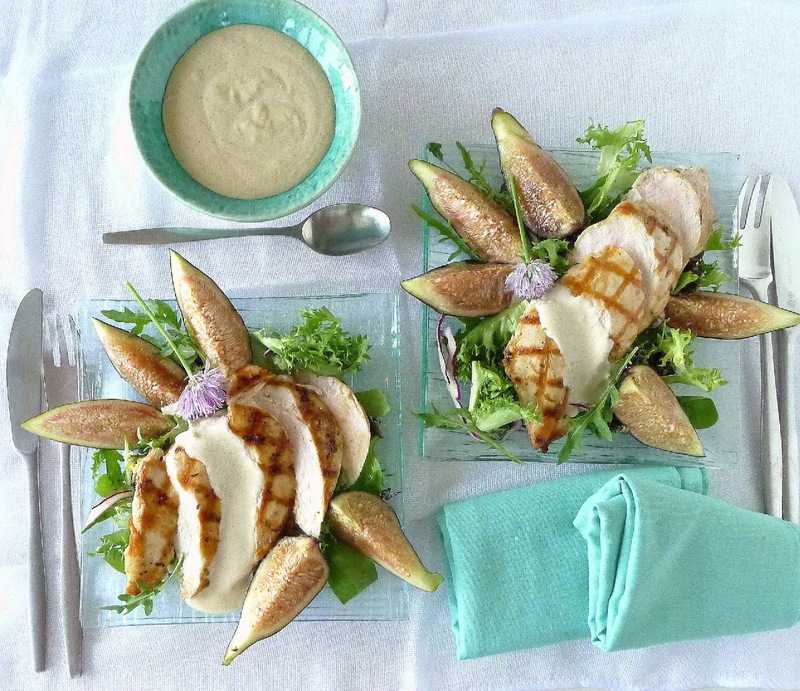 Spoon about 1 tablespoon ajo blanco sauce over each salad. Serve remaining sauce separately. Ajo blanco sauce (almonds, garlic, vinegar) complements chicken and fruit. Ajo blanco, which actually means “white garlic,” is a chilled summer soup, a white gazpacho (there’s a link to that recipe at the end of this post). This is a version that serves as sauce or salad dressing. 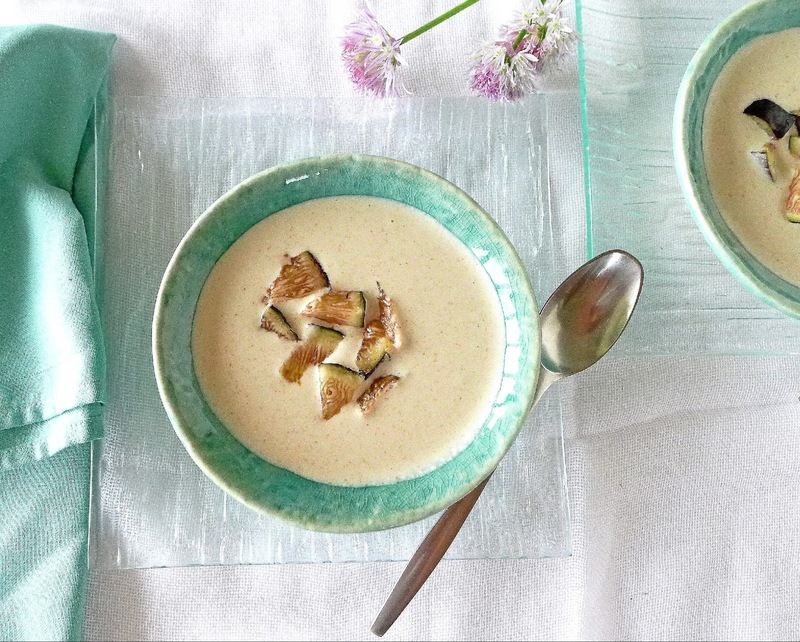 Could ajo blanco sauce be the new tahini? Made with almonds, garlic, vinegar (or lemon juice) and garlic, quickly combined in a blender, it’s certainly just as versatile. Serve it with grilled chicken or fish, with green beans, potatoes or eggplant. I used subtly sweet Pedro Ximenez Sherry vinegar in this recipe (see last week’s blog for more about vinegars). 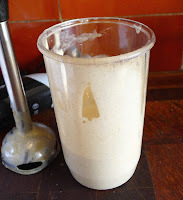 Break the bread into pieces and place them in a blender container with the vinegar and ¼ cup of water. Allow to soak 15 minutes. Add the almonds, garlic and oil to the blender. Process until very smooth. Season with salt and thin with remaining ¼ cup of water. Store the sauce, covered and refrigerated. If necessary, stir in additional water to thin the sauce.